What Do The International Tourists Need for Their Stay in Karuizawa? On September 2014, Karuizawa 72 Golf (East course) hosted The World Amateur Golf Tournament for a 2 week period. The team of a total of 1,000 players and delegates from 70 countries- North and South America, Europe, Russia, Middle East, Asia and Oceania- participated the tournament. IAK took part in this event by setting up an “information desk” in the Prince Hotel lobby area giving out tourist information of Karuizawa and other areas. IAK encountered the following problems in guiding them to the destinations. 1. The information currently available for tourists (pamphlets etc.) only introduces each tourist spots and does not provide information of how to access to each place (by bus or on foot). Each spot does not relate to others thus it is difficult for tourists to travel from one spot to another. 2. It is difficult to identify your location on a map because there are no signs in the intersection and on the street corners (Japanese or English). 3. The bus stops in Karuizawa Station North and South Exit have no destination signs written in foreign languages. 4. No information available concerning the location of currency exchange (banks etc. ), credit cards acceptable shops and restaurants. 1-4 above is a barrier for foreign tourists and gives an impression that Karuizawa is a difficult place to go around. 5. Either due to lack of the information of Karuizawa or lack of things that would interest foreign tourists, the inquiries about Karuizawa were limited to Shiraito Falls, Karuizawa Wild Bird Sanctuary (Picchio), and supermarkets. The majority of the inquiries from the team were related to Snow Monkey (Shiga Kogen), Zenkoji Temple, Matsumoto Castle, Tokyo and Kyoto. 1. Recognize the value of Karuizawa and start a joint work with Matsumoto University Department of Tourist and Hospitality Management, Professor Masuyama (an IAK member) to make proposals. 1) Maintain the quietness of a holiday resort area, coziness of residents. 3) Improvements on barrier-free environment for foreigners (which is also useful for Japanese tourists). 4) An increase of free Wi-Fi areas for easy access to tourist information. We consider you do have some opinions. We welcome many comments and participants from both members and non-members. On April 1 IAK opened its office by relocationg its function from Chairman’ residence in the past three years. 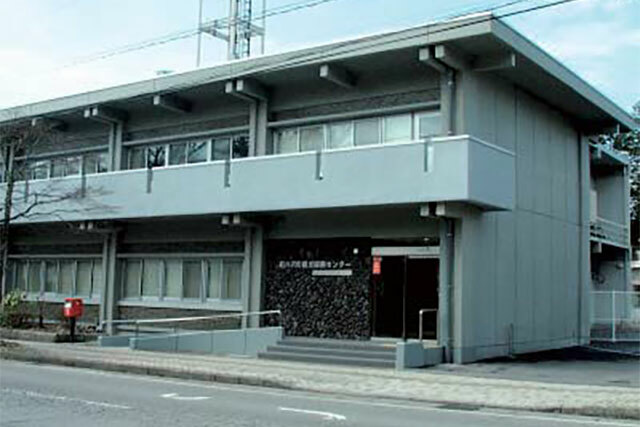 New office is located on the 2nd floor of Karuizawa Kanko-Shinko Center (Tourism Promotion Center) on KaruizAwa’s main street from Shinkansen Station to Kyu-Karuizawa Ginza. This building is renovated, on 20-year lease to Town Office from NTT, to provide incoming tourists with travel information. The office space is 18 square meters at monthly rent of \ 12,000 including utilities costs, furniture and Wi-Fi facilities. Karuizawa Tourist association also relocated to open the office on the 1st floor with reception counter for tourists. Town Office aims at making The Center as bridgehead of internationalization of Karuizawa and IAK will have more opportunities to work with neighbor tenants in the Building. Other tenants will be National Trust of Karuizawa and R.C.C. of Convention Bureau. There are a spacious meeting room which can be dividable into two separate rooms, next to IAK office. The only disadvantage of the building does not accommodate enough space for car-park. Visitors are requested to use near-by car-park facilities. IAK does not have a plan to hire any employee due to financial reason, but will keep the office by volunteer members as necessary. For time being Chairman’s house will work to support communication among members. The party was held at Sala Karuizawa Hotel on December 14, 2014 to have 90 guests who enjoyed members’ performances over cocktails and meals. 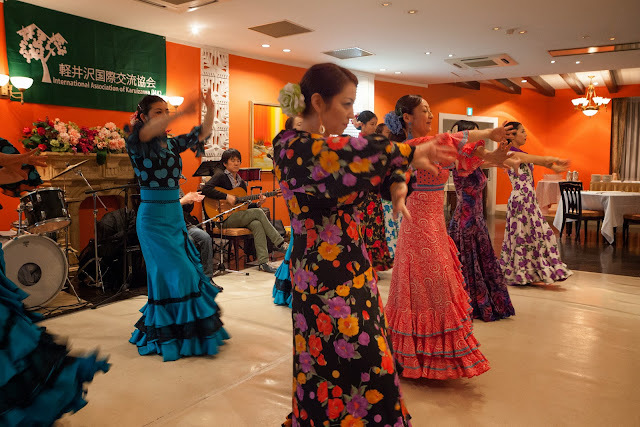 In addition to familiar players and dancers on stage, new programs were introduced by Spanish Flamenco dance with music and popular rock music band. Attendees were impressed by their skillful performances. We wish a magic show could be more fun to the party. The Karuizawa International Curling Championship, accredited by the World Curling Tour (“WCT”) was held from December 18-21, with the participation of total 11 women’s teams and 15 men’s teams. IAK actively played the interpretation role among the TV crew, newspaper reporters, and the Karuizawa Curling Committee members, starting with the press conference with the TV ASAHI, ABN Nagano Asahi Broadcasting Network, and Shinano-Mainichi Newspaper Company. Among the above participating teams, Canada’s women’s team was the World Champion and the undefeated Gold-medal Winner of the 2014 Sochi Olympic Games, while Canada’s men’s team was proud of their 4th ranking in the World Championship. Among the visiting teams, Korea outnumbered others with 7 teams, while from Japan, 14 teams participated, including the LS Kitami lead by Ms. Motohashi and Chubu Electric Power Company lead by Ms. Fujisawa. At the press conference, the Russia’s women’s team attracted almost all the camera crews, and they were surrounded by them for quite some time. No wonder, all of their team members were professional models as well. They brought with them an exclusive interpreter of their own. Town office hosted the 3rd Pot-luck Party at Chuo-kominkan on February 14, 2015 and more than 200 attendees participated in it. 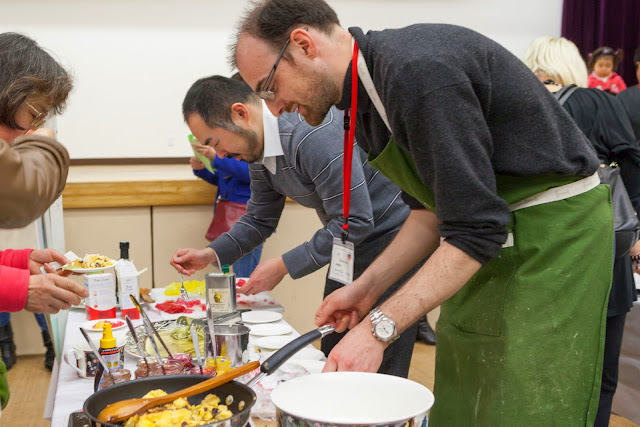 As before IAK cooperated with Town to dispatch 9 teams of foreign resident chefs to cook their home country dishes for 50 persons and serve them at the party. ISAK, an IAK member made presentation of activities at their booth. *Please confirm the place for Hotel Wellies or Pension Hoshinoko on IAK Homepage or Facebook. *No special topics in English & Japanese. Daily conversation and Japanese culture. *Beginners to advanced with ￥300 per person including admission fee for Kazakoshi. (no charge for school kids.) Need clean indoor gym shoes for the sports surface. *All levels with ￥500 per person. Need comfortable clothing without zips or buttons. *All levels. ￥100 for rental shoes. Fee for the competitions are split by participants. After the consecutive holidays in May, IAK Secretariat will send a mail to all members to confirm if they will attend or not. If not, return their proxy of any resolution made in agenda to the Secretariat accordingly. Ostomy surgery is medical operation to build an opening in the body for the discharge of body wastes for patients who suffer rectal cancer or bladder cancer, etc. Those people are called “Ostomates” in the world. I myself have had my bladder been taken out because of cancer 21 years ago and I live always with a urine bag put on my abdominal wall. The incidence rate of Ostomates is nearly 0.15% in the industrialized countries and there are about 200,000 Ostomates in Japan. In many countries, Ostomates form organizations for mutual support and social movement. Japan Ostomy Association (JOA) was founded in 1969 and I am now serving as the president. National associations organize international body and JOA is a member of the Asian and South Pacific Ostomy Association (ASPOA), which forms the International Ostomy Association (IOA) with those of Europe and American Continents. Ostomy bags to collect body waste are indispensable for Ostomates life, but it is only 30 years since quality bags became available in Japan. In less developed nations, such bags are not produced and imported bags are too expensive to afford. Medical and nursing are also less developed, so many Ostomates in those countries are in miserable situation. Then, associations in the western countries conduct projects to donate ostomy bags to those people in needs. JOA has been sending ostomy appliances to Mongolian and Vietnamese associations since 10 years ago. I have visited those countries often to make research and push the governments to take action to provide local Ostomates with financial support. International cooperation of the disabled and by the disabled plays important role for the self-reliance and development of social welfare for those people. Organizations of the disabled have participated to the 3rd World Conference on Disaster Risk Reduction in Sendai last March and proposed provisions of disaster prevention of the disabled, who are tend to suffer from disaster more than ordinary people. I wished to present this note to make IAK members know that this kind of international cooperation are working. Donation member has no voting right at AGM.